Before I show you the delicious, amazingness that was my bacon, avocado blue cheeseburger (yeah, it was…wow…just simply wow), I have a little story to tell you about the last time I was home. 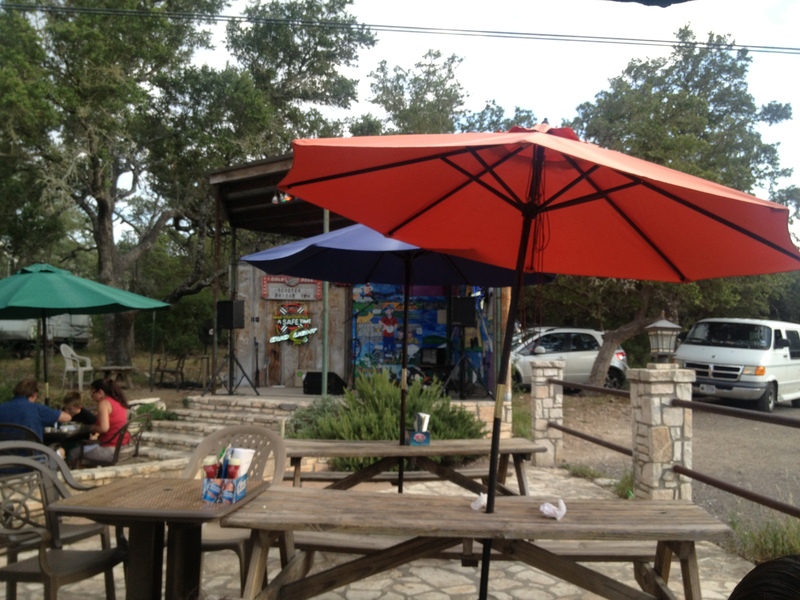 About 16 miles from Fredericksburg is a slightly-hard-to-find-but-oh-so-worth-it restaurant called Alamo Springs Cafe. Their burgers and onion rings are quite simply (as the kidlets say today): off the hook! Apparently everything on the menu is tasty. People I know, love, and trust with food recommendations will confirm this. I personally don’t know. Despite any delusions I may have about menu-ly branching out before I get there, I always get a burger and onion rings. So when I was home last spring, I assembled the family to go out to Alamo Springs, which requires 2 cars and a 30 minute drive, as the majority of the 16 miles is on a small, winding county road. So we caravan out there. Aaaaand…it’s closed. All week. For spring break. WAAAAAAAAAAAAAAAAAAAAAAAAAH!!!!!!!!! After some good humored ribbing while we walked back to the cars, we caravan back to town. 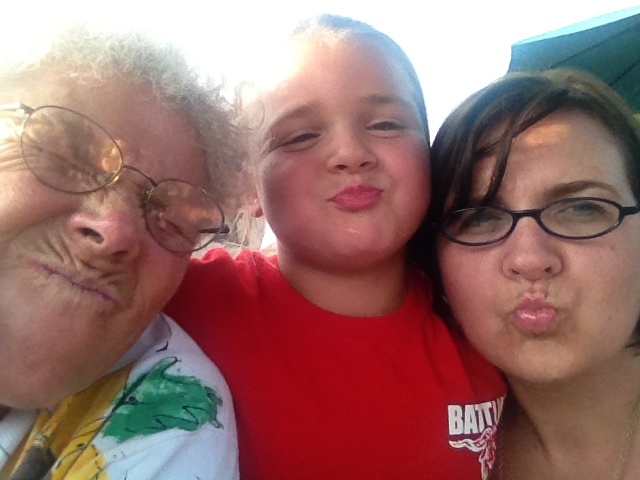 It made for some great family bonding. What? That’s my story and I’m sticking to it!! Fast forward to this trip. To avoid the same fate, my sis-in-law calls under the guise to make reservations (a good idea if it’s a Friday or Saturday night! ), but I know it was to make sure they were, in fact, open (you can also check on their Facebook page)! Good thing too, because YUM YUM YUM YUM YUM YUM…YUM to the infinity! 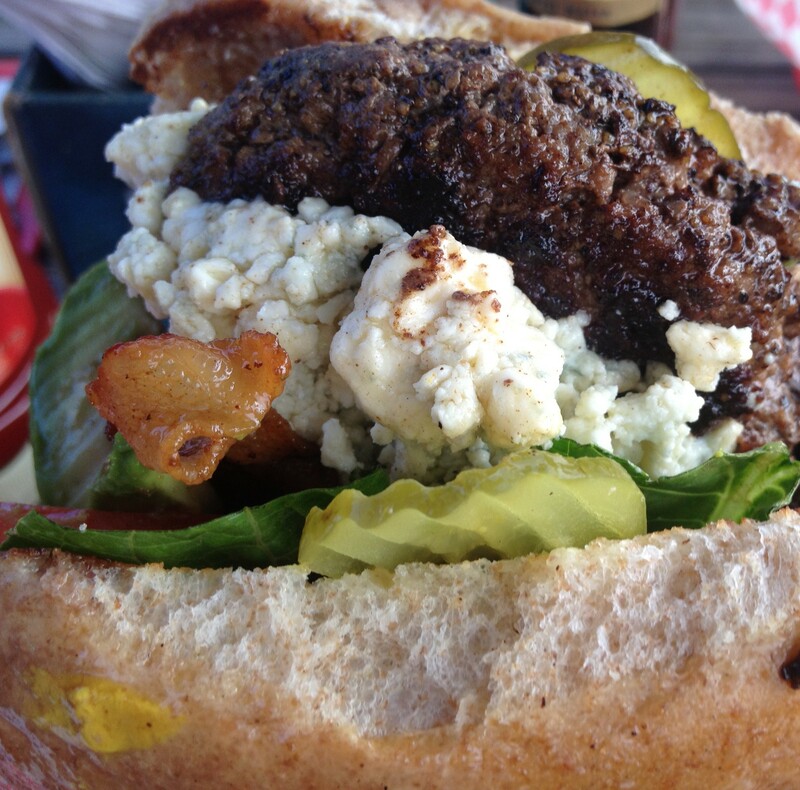 There are so many amazing things on the menu, but how can you ever go wrong with building your own burger?!?!? 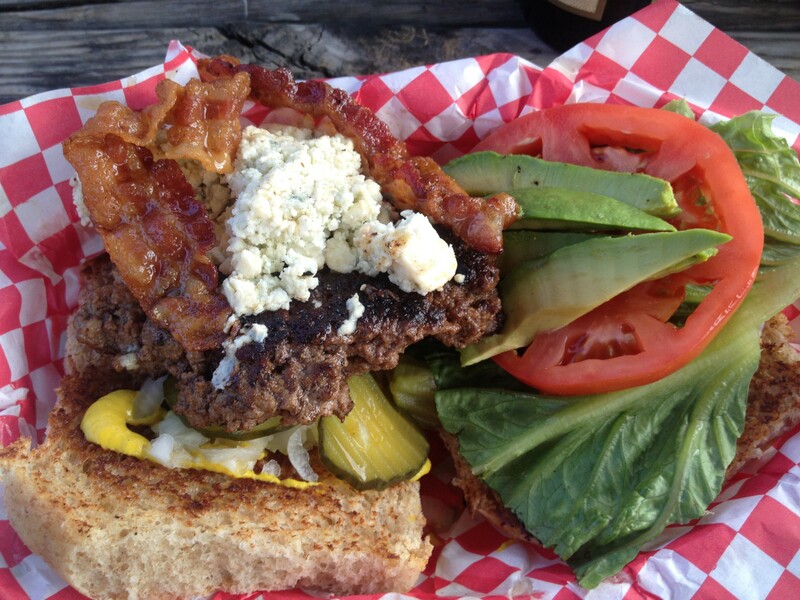 Alamo Springs offers a plethora of burger add-ons–almost to the point of being hard to narrow it down. Feeling extra indulgent, I went with avocado, blue cheese, and bacon. But I was a good girl and opted for the whole wheat bun rather than the jalapeno cheese bun! This is what was soon set in front of me. One all beef patty, mustard sauce, lettuce, tomato, avocado, bacon, blue cheese, pickles, and onions on a whole wheat bun! The meat was juicy. The bacon was crisp. The avocado was creamy. The blue cheese was tangy. Altogether it was magic. But wait! There’s more! You can’t forget the onion rings!! A looooong time ago, they used to serve shoe-string onion rings, which I prefer ever-so-slightly more than these babies. But you won’t find me complaining–the batter is fried just enough to give them a satisfying crunch when you bite into one and the onion just melts in your mouth. The only bad part about them is reaching the bottom of the basket!! Ultimately, it’s a great place to spend laughing and drinking and just enjoying spending time with the family–and isn’t that what trips home are all about? 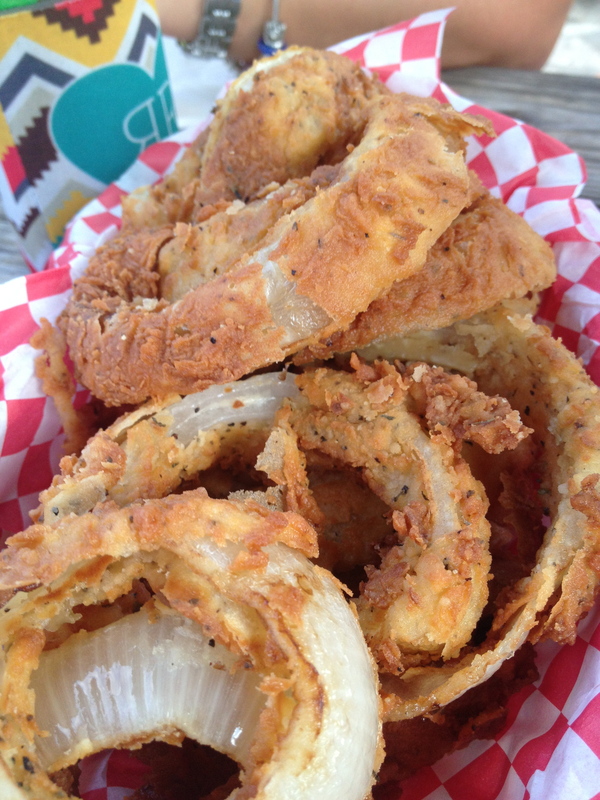 So…you know of my quest to find the perfect onion ring yet you did not bring me here when I visited you in Texas!